The Wounded Warrior Transition Program was developed by the military to help transition wounded warriors, of all service branches, either back to their units if they are physically able after rehab or assist them in transition to civilian life if they are medically discharged from the service. The AUSA is a national, not for profit organization, with local chapters throughout the United States and overseas, whose mission it is to support soldiers and their families, Active Duty, NG, Reserve and Retired. The Ft. Leonard Wood Chapter of the AUSA has developed a Wounded Warrior Fund that assists these service members and their families with morale and welfare activities, along with emergency financial support as they process through the transition program. The FLW Chapter of the AUSA funded the airlines tickets and a $500.00 expense stipend for the Turner Family. Eagle Travel, LLC, a corporate sponsor of the FLW AUSA, provided the accommodations in Jupiter. Sergeant Jeremy Turner represents the Wounded Warrior Transition program at Ft. Leonard Wood (FLW), MO. Sgt. Turner is the recipient of the Purple Heart for wounds he received in Afghanistan when his Scout Vehicle detonated a 200 lb Improvised Explosive Device (IED) while in pursuit of Taliban terrorists. 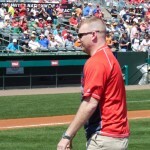 Sgt Turner throws out the first pitch to a standing ovation from the sold out crowd in Jupiter, FL on March 16th , St. Louis Cardinals vs Detroit Tigers. Marine Major Grant Clester and his family is hosted by the Little Patriots Embraced, a military family advocacy organization that has served over 18,000 children of service members being deployed throughout the world. 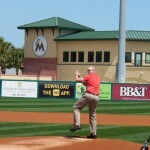 Major Clester is also honored as he throws out the ceremonial first pitch in Jupiter, FL, the home of the St. Louis Cardinals Spring Training Camp. 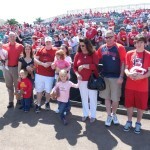 Sergeant Jeremy Turner, accompanied by his wife Tonya, sons Brandon and Jeremy Jr. and 2yr old daughter Lacy, represent the Wounded Warrior Transition Program at Ft. Leonard Wood, MO and Major Grant Clester, his wife Theresa, Little Patriots Maggie 5, Alex 3, and Kate 9 months and Carol Watanabe, President Little Patriots Embraced in front of the Cardinals dugout while they await recognition and the ceremonial first pitch. 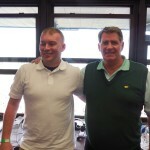 Sgt Jeremy Turner and announcer Mike Shannon after their interview on KMOX during the second inning of the Cards vs Mariners game on March 17th. Mike was emotionally touched when they discussed the incident for which Sgt Turner received his Purple Heart and how the Army provided for his recovery and rehabilitation.